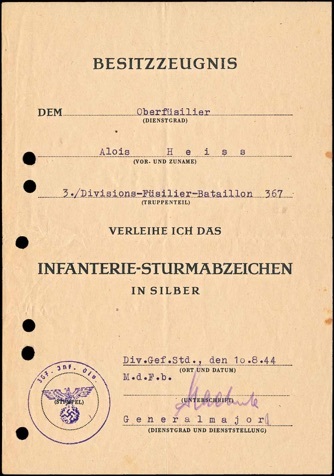 Pair of documents to Army Oberfüsilier Alois Heiss, 3 Division Füsilier Bataillon 367. It was a part of the 367 Infanterie Division, which was formed November 1943 near Agram, Croatia. It took part in anti-partisan operations in Croatia November 1943 to February 1944. From February 1944 to January 1945, it operated on the southern sector of the East Front. From January 1945 on it operated in Poland and was destroyed March 1945, Königeberg, East Prussia. The award of the Black Wound Badge was earned 23 April 1944 and made 7 June 1944. Heiss was a Füsilier at the time. 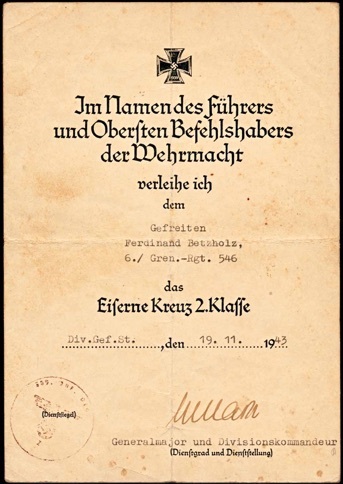 It is signed by the Oberfeldarzt and Chefarzt at Reserve Lazarette Köthen-Anhalt. It has a center fold and binder holes. The award of the Infantry Assault Badge in Silver was made when Heiss was an Oberfüsilier. 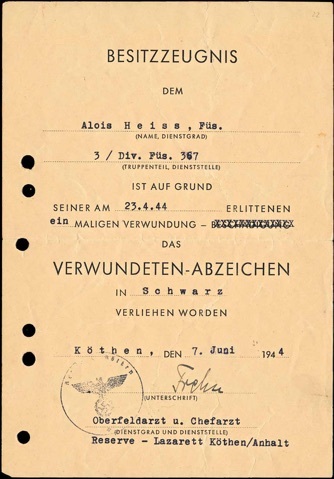 It was awarded 10 August 1944 and is signed by Infantry Division 367 Commander, Hermann Hähnle. Hähnle was promoted to Generalmajor 1 March 1944, and was a recipient of the German Cross in Gold. He was a prisoner of the Russians from 8 May 1945 to 8 October 1955. The document has a center fold and binder holes. Nice set to a combatant. 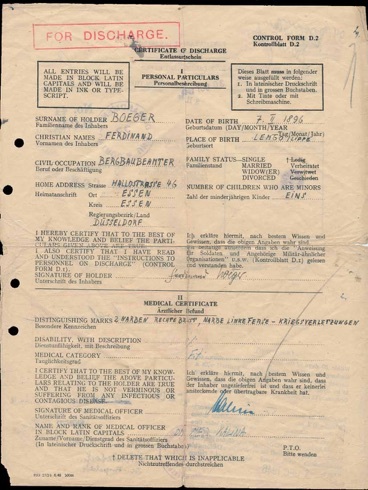 Pair of documents to Army Gefreiter Ferdinand Betzholz, 1 Grenadier Regiment 546. Under the 389 Infantry Division, from January 1942, it was designated a “sorm and impulse” division, made up of combat veterans. From May 1942, it was on the East Front as a part of the 6th Armee under General der Panzertruppe Friedrich Paulus. They participated in the summer offensive Operation Blau with the aim to capture the Caucasus and Stalingrad. During the Battle of Stalingrad, the 389th was the main force of the failed attack on the tractor factory. The division’s remnants were captured 2 February 1943. The division was reformed 17 February 1943 in France, and by September 1943, was redeployed again to the Eastern Front. Casualties were high was it fought in the Dnjepr area. After 25 January 1944, the division was pushed into the Korsun-Tscherkassy Pocket. Again the 389th was reformed in March 1944, Hungary. It was part of Army Group North in the Kurland Pocket. The award of the Infantry Assault Badge in Silver was made 9 November 1942 and is signed by the major and regiment commander. The document has a four way fold. The Iron Cross was awarded to Betzholz when he was with 6 Grenadier Regiment 546. 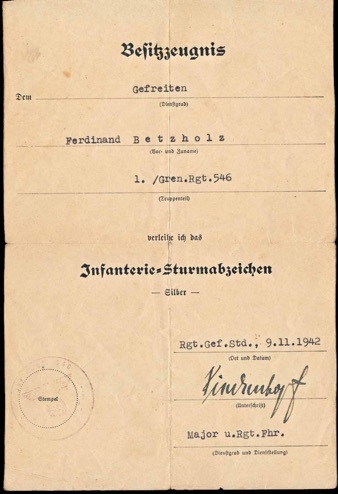 The award was made, 19 November 1943 and is signed by Generalmajor and 389 Infantry Division Commander Erwin Gerlach. Gerlach was a prisoner of the Russians, 9 May 1945 to 9 October 1955. Nice set to a combatant who had to have been at Stalingrad and Tscherkassy. 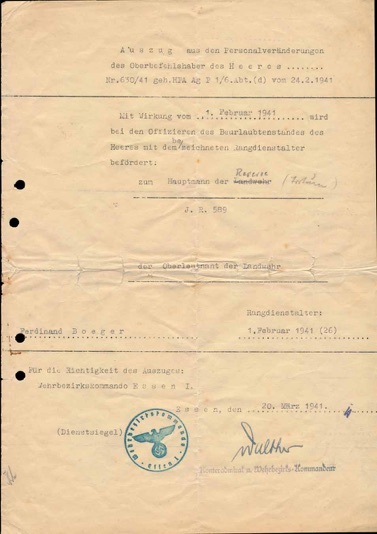 Document set to Army Oberleutnant and later Hauptmann Ferdinand Boeger, Stab Infanterie Regiment 517. 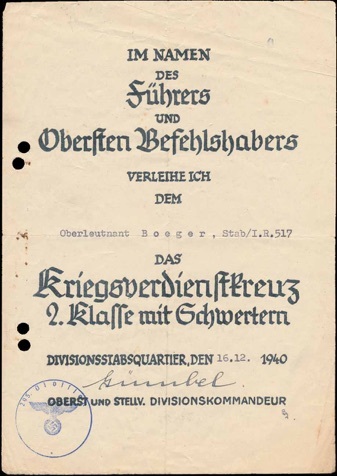 The award of the War Service Crss 2nd Class with Swords was made by the 295 Infanterie Division, 16 December 1940 and was signed by then Oberst and Division Commander Karl Gümbel. Gümbel attained the rank of Generalluetnant and was awarded the Knight’s Cross. The 295th Infantry Division was in Belgium and France, May 1940 to June 1941. From September 1942 to January 1943, it was at Stalingrad.From March 1943 to May 1945, Norway. 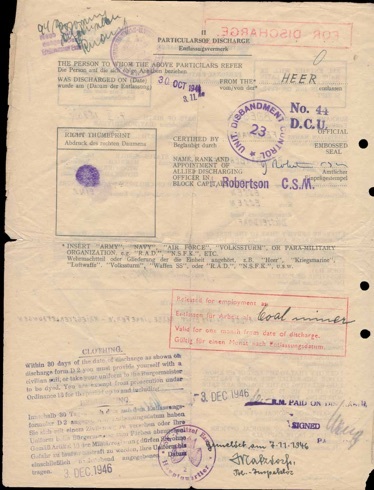 Included are his promotion to Hauptmann, February 1941, and his discharge from the military, December 1946. It noted two scars on his chest and on his heel.